Home »Posts Tagged "Sexual Relationships"
The online dating and matchmaking website “Be2” has put together fun and interesting facts about dating, relationships and gender stereotypes in general. 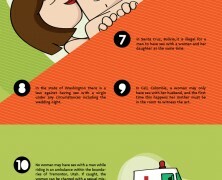 See the infographic with a fun and colorful comparison of gender stereotypes. This is really weird. A unique experience about how different cultures conceptualize sexual relationships.